Christian pattern of the cross next to a floral motif. Cross stitch pattern of wild flowers on an orange background. 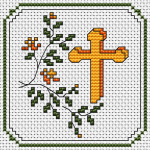 Believe well and have well.Bookmark cross stitch pattern with the text:"Believe"
Cross stitch pattern depicting an old church.The text is:"The Old Church is still standing... GOD cares for you". 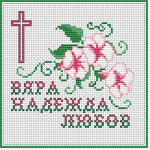 Faith, Hope and Love is the text on this cross stitch pattern.Includes flowers (Morning Glory) and а cross. 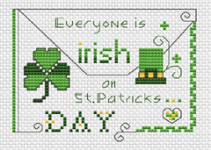 "In God We Trust" is the official motto of the United States.A cross stitch pattern of the national emblem of the USA - the bald eagle and the flag of America. 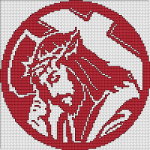 Portrait of our Savior Jesus Christ carrying the Cross.A round monochrome pattern in red, which in Christianity is associated with the blood of martyrs and the Resurrection.of Jesus Christ.